Doward Hill comprises of the hills of Great Doward and Little Doward and is overgrown with trees and scrub with a maze of public footpaths leading to remote prehistoric caves and redundant limestone quarries and limekilns. 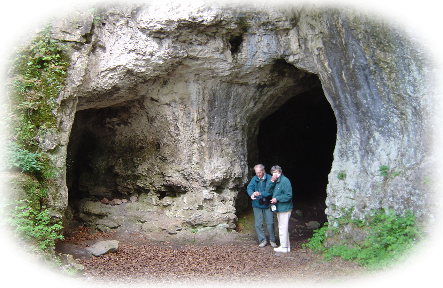 Tucked away deep in the dense woodlands of the Doward, are a series of prehistoric caves and caverns, the most notable of which is probably Arthur’s Cave. 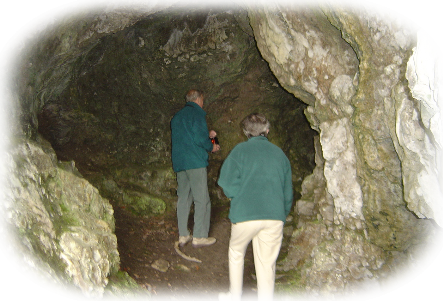 Arthur's Cave is situated high in Lords Wood above the Seven Sisters Rocks. It is one of the surviving limestone caves occupied 12,000 years prior to the arrival of the Roman Legions and is thought to date from around 80,000 BC which actually precedes the birth of its proclaimed hero, ie King Arthur, and hence it may have no actual associations with him at all. Although the cave has a wide entrance, it is just 2 metres deep but has several dark nooks, crannies and short passageways. Occupation can be traced back 60,000 years to the Ice Age through to the Middle Stone Age of 10,000 years ago, then the Bronze Age and through to the arrival of the Roman Legions. There have been several archaeological excavations and explorations, including blasting with dynamite in the 1870’s followed by a major excavation in 1927 when the earth extracted created the large mound in front of the entrance. The findings and extractions suggest that the glaciations of the Ice Age probably came very close to the cave and its nearby shelters and it is possible the caves might have been occupied early but any evidence will have been washed away. However, Palaeolithic remains have been found together with remains of deer, pig, beaver, brown bear, wildcat, marten, hedgehog, mammoth bones, hyena and woolly rhinoceros. Some of these findings are displayed in Monmouth and Hereford museums of while others being examined and displayed at Bristol University's Spelaecological Museum were destroyed in a bomb raid during the Second World War. Not far away, on a huge rock outcrop near Old Forge, is Merlin's Cave, formed by water eroding away the limestone rock fissures. This is found by following a forestry track towards Biblins for 1.5km and turning left on a path following the River Wye. This pathway narrows and approaches a steep incline beyond which is the cave entrance formed of a chamber and an alcove. Like Arthur's Cave, human occupation can be dated back to the Palaeolithic period. Fewer findings have been unearthed than those of Arthur's Cave but have included dog or fox bones, a Roman coin, Roman pottery, a Bronze Age beaker and amber beads. The Roman findings probably have links with the large Roman Villa remains found at Huntsham.